Once more the brave adventurers Brother Candor, Pike, Dordagdonar, Iriadessa, and Vladimir plunged headlong into the dungeons of Dwimmermount, continuing their explorations of Level 2. The characters are of mixed levels, with Brother Candor and Dordagdonar both level 3, while Pike and Iriadessa are level 2, and poor Vladimir still at first level. For some reason, I find a mixed-level party very satisfying to me. I suspect that's pure nostalgia talking, as it was very commonplace in the old days to have a wide spread of levels in the same group. Partially, of course, it's a function of the different XP requirements for the various classes, but there are other factors too, such as the introduction of new PCs into an existing campaign. In any event, I'm very pleased with the group and how it's progressing. There were comparatively few combats this last session, as the players spent most of their time mapping out unknown areas of the dungeon and grappling with its mysteries. There were fights with a swarm of angry oil beetles and a giant black widow spider, but that was about it. Having slaughtered 20 beast-men in their last foray, they seem to have de-populated a goodly portion of their current area of operations. This was perhaps fortunate, since there were numerous traps and oddities with which to deal. In one room, the characters encountered a strange manhole cover-like object that could not be pried open. When sufficient weight was placed on it, the object descended about 20 feet into a darkened chamber filled with an oily, black liquid. Because the characters couldn't see the size of the room or whether it had any inhabitants, they hastily pulled up Pike, who'd volunteered to take a look on the condition he had a rope tied around him for just such an emergency. Later, the characters found a darkened room from which no sound, smells, or light emanated. Entering it, one was swallowed up a palpable blackness that left only one's sense of touch intact. Brother Candor (again, with rope attached) went in to examine the place by feeling his way around, which led to the discovery of a large hole in the middle of the room. A bag filled with copper coins -- the characters consider copper worthless -- was lowered into the hole until the rope went slack, which turned out to be about 20 feet down. The bag was pulled back up and removed from the room. It was found to be covered in an oily, black liquid, which was combustible. However, the liquid was consumed so quickly by the flames that it did not burn the bag at all, even though it generated (brief) heat. The characters now assume the two rooms both lead to the same place beneath them, though they have no idea what the black liquid is or what purpose it might serve. Another room contained a door covered with what the characters assumed to be magically trapped glyphs. Because the door opened outward, they hammered an iron spike into the floor a distance away from it, tied a rope to the door's handle, looped the rope around the spike, and then pulled on it from a safe distance away. This way, no one was directly in front of the door should opening the door activate the glyphs, which they did. I was quite amused by their cleverness. They're getting very good at foiling traps. I guess I'm going to have to be more devious in future. In their explorations, the PCs discovered numerous dead bodies, which they presume to be those of other adventurers. They'd seen evidence -- chalk marks, messages painted on doors, etc. -- that someone else was exploring the dungeon ahead of them. They'd even ordered a couple of their hirelings, twin Norsemen Erik and Ethil, to hang out in the inn at Muntburg to see if they saw anyone who looked like they were also heading off to explore Dwimmermount. Unfortunately, their hirelings are overly fond of drink (and women's boots, as it turns out, but that's another story), and so remembered seeing no other adventurers. Because the dead bodies consisted first of a dwarf, then a cleric of Tyche -- whose holy symbol Brother Candor intends to return to the temple in Adamas in an effort to curry favor with them -- the suggestion was made, in jest, that maybe these people were the PCs from the future. When it was pointed out that these bodies couldn't be the PCs because there was no dead elf among them, Dordagdonar said, "Of course not. I would have abandoned the party if you'd gotten into any real danger." Needless to say, no one completely trusts the elf. 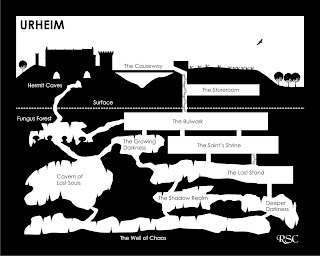 Courtesy of Cartographer Extraordinaire, Rob Conley, here's a sideview of Urheim. Lots more coming on this front, so stay tuned. With a day to go in the Lulu Author Sales Contest, Fight On! has risen again to the #2 spot and Swords & Wizardry has risen to #5. This is really excellent news -- but it could be better still. If you haven't bought something from either publisher, please consider doing so in the next 24 hours. It'd be an amazing turn of events if either -- or both! -- made it into the Top 3, which would earn them cash prizes as well as free publicity from Lulu in the form of free advertising and an interview on the site's blog. 2008 was already a remarkable year for the old school renaissance. Let's make 2009 and even more remarkable one. One of the things I really love about my Dwimmermount campaign is how readily my five players have all, to varying degrees, contributed to the development of the still-vague game world in which the megadungeon exists. This is particularly in evidence when it comes to the portrayal of the demihuman races. In our latest session, we discovered a few things about the nature of dwarves, since Vladimir rejoined the party after a long absence. (As an aside, I am gratified that Dwimmermount's dwarves seem to be vaguely Slavic in conception rather than the Germanic or Scottish stereotypes that typically afflict the race). When asked where Vladimir had been while the party was off in Dwimmermount, his player explained that he'd been "making my baby." What he meant, of course, was that Vladimir had been using his time and treasure to carve a son for himself. As I believe I mentioned once before, my dwarves are free-willed earth elementals who usually don't venture out from their subterranean strongholds. They're thus rather alien in nature, at least by human standards. I decided to sidestep the whole question about what dwarf women look like by establishing outright that there are no female dwarves at all. Dwarves reproduce (slowly) through a long and expensive process of crafting their descendants from living rock. Consequently, most dwarves don't really get the idea of gender or sexual reproduction, leading to all manner of misunderstandings when dealing with non-dwarves. We also concluded that, because the process of crafting a descendant was so expensive, the newly-born dwarf -- who enters the world a fully functional adult -- is expected to repay his father and his clan, preferably in raw materials like precious metals and jewels. Most dwarven adventurers are in fact on quests either to repay their fathers for the expense of making them or trying to acquire enough valuables to be able to craft their own child. Thus, dwarves aren't really greedy so much as needy; they wish to acquire wealth to ensure the perpetuation of their elemental race and the cultural practices that have grown up around it. As for elves, it was interesting how many later accretions to the OD&D conception of the race we just accepted without any thought. For example, we never once considered that sleep or charm spells might affect Dordagdonar, because we all knew elves were immune to both. They are in AD&D true, but no such immunity is noted in the three little brown books. Accepting this led Dordagdonar's player to assume that elves are immune to sleep because elves never sleep. They are always awake, which is why some elves, particularly younger ones, quickly grow bored and seek out excitement, even if it is among "ephemerals" like humans. Elven adventurers are thus elves with really short attention spans. We had also previously established that elves have quite the sweet tooth, with sugar acting as a mild narcotic, thus leading to jokes about "Pixie Stix addicts." And these are all details that evolved through play, springing from tiny germs I'd planted early on in the campaign. I absolutely love this kind of stuff and see it as part of why I love this hobby so much. One of the things I liked about growing up in Baltimore in the 1970s was that many of the local movie theaters regularly showed older classic films in addition to first-run features. Consequently, I had the benefit of seeing lots of great motion pictures on the big screen that had been released years before I was born. One of the ones I most vividly recall was 1963's Jason and the Argonauts, a movie that I now connect not just with my childhood but also with Dungeons & Dragons. There are a lot of reasons why this is so, starting with the basic premise of the film (and the Greek myth on which it's based): an adventurer gathers together a band of other adventurers to set off to an unknown land in search of a treasure with which he hopes to reclaim the kingdom usurped from his father when he was a baby. But it's the dangers Jason and his Argonauts face that make me think most of D&D. There's Talos ("called a triple iron golem" in the Dungeon Masters Guide and illustrated by Dave Sutherland in the Monster Manual), the hydra, the harpies, and of course the "children of the teeth," skeleton warriors used by King Aeëtes of Colchis to try and stop Jason from escape with the Golden Fleece. 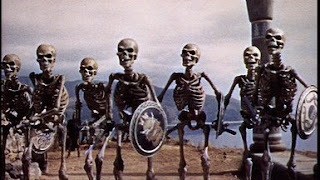 Those skeletons made a huge impression on me as a kid, as I suspect they did on Gary Gygax. If you check out the nifty skeletons available from Otherworld Miniatures, you'll see that some of them bear shields that are identical to those from Jason and the Argonauts. Ray Harryhausen was my patron saint as a boy. I ate up all the movies on which he worked, like this one and the various Sinbad films, all of which I saw in theaters during the 70s. Remember that this was in an era before VCRs where readily available and well before there was a huge library of old films available for viewing by later generations. I don't know if my experience in seeing these movies as they were meant to be seen was unique, but I consider myself lucky for having had that opportunity, because my imagination was informed not just by the works of my own time but by those of the generations before me. Maybe that's why, even though I'm younger than the earliest generation of gamers, I still feel like I have a kinship with them. D&D never felt "old fashioned" to me, but perfectly in line with the conception of fantasy I've held since a very young age -- and still do. I bought a copy of Jason and the Argonauts on DVD this weekend and watched it with my nine year-old daughter. She's got a love for mythologies of all sorts and plays in my weekly Dwimmermount campaign. She's still a little young to quite get into the game on the same level as my friends, but she's a quick learner and I feel a certain obligation to accommodate young people who take an interest in what might otherwise seem a very esoteric hobby. My daughter was a bit frightened of the harpies at first, but she otherwise enjoyed the movie a lot, particularly the hydra. She also took special interest in all the scenes on Mount Olympus, but then, when Honor Blackman is playing Hera, I can't say I blame her. I'll probably try and acquire copies of the Sinbad movies too and watch them with her in the coming weeks. I see no reason why my children should be deprived of the "classical education" I received when I was their age. I've always strongly associated the works of Jack Vance with those of Gary Gygax. Not only did D&D's co-creator readily admit to the huge debt the game owed to those works, but I hear Vancian echoes in the cadences of High Gygaxian. Gary was flattered by such comparisons, given his great regard for the author of The Dying Earth, but felt his own unique writing style couldn't hold a candle to that of Vance. Even so, these two writers had many points of commonality, not least of all their liking for roguish characters and appreciation for sardonic humor (a trait they also shared with Clark Ashton Smith). 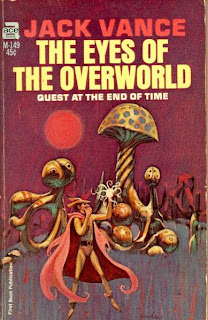 These points of commonality are particularly in evidence in The Eyes of the Overworld, the 1966 novel that introduces Cugel the Clever, perhaps the best known character from The Dying Earth series. Cugel is a silver-tongued thief, who fancies himself a member of the natural aristocracy, a man whose intellect and refinements are far above those of most other men, thereby entitling him to anything his wits can win, regardless of the means by which they do so. Of course, Cugel is no such thing, being at best a semi-successful con man, brigand, and philanderer who falls prey to the wiles of others at least as often as the reverse. And therein lies the character's charm -- his fallibility. Cugel is certainly far from a hero, as his often despicable actions make plain, but neither is he an admirable anti-hero, a character whom we respect precisely because he challenges the status quo. Cugel is, in my opinion, a very human character and his vicissitudes are generally self-inflicted, brought on by a combination of bravado and concupiscence; he suffers as much as he benefits from his trickery. To call him a "lovable rogue" is not to do him proper justice, but the phrase will have to suffice as short hand for describing just why I was attracted to rather than repulsed by Cugel. The Eyes of the Overworld is a Picaresque novel that follows Cugel on a quest to find an item called an Eye of the Overworld. The Eye is a magical purple gemstone that, when worn as part of a pair, provides the wearer with a sublime vision of the world, one that turns shacks into mansions and hags into goddesses. Cugel must find the Eye as part of a bargain with the powerful wizard Iucounu, into whose home he had broken and by whom he'd been caught. Rather than slay the would-be burglar, Iucounu places an alien being inside Cugel's body. This creature, called Firx, possesses many hook-like appendages with which he can internally "encourage" Cugel to keep his mind on his appointed task. The wizard then sends Cugel to a far-away land and the main plot of the novel begins, with Cugel simultaneously trying to undertake his mission and extricate himself from it. While doing so, he encounters many amusing characters, strange sights, and demonstrates again and again that he is neither respectable nor trustworthy -- nor as clever as he believes himself to be. Cugel, along with the Gray Mouser, was almost certainly one of the inspirations behind the thief character class. Reading this book gives one a slightly different perspective on the thief. Cugel may be a lovable in some sense, but Vance never lets the reader forget that he's also a selfish, lying coward whose greed, lust, and general viciousness rain misfortune down upon him as much as those he swindles. The Eyes of the Overworld is too humorous to merit being called "dark" and yet there is more than a touch of darkness to it, as there often is with Vance's best works. I think that's part of its appeal: it superbly juxtaposes wit and moral turpitude in ways that provide genuine insight into the baser natures of human beings, all the while never forgetting that it's a fantasy adventure story whose primary purpose is to entertain. It's rare to find an author able to produce a novel of this sort, especially one that isn't "heavy" or didactic, while being humorous, but Vance has done so and I appreciate it greatly. Produced by Matt Finch and jointly published by Knockspell and Fight On! magazines, Art of the Old School represents an effort to win the Lulu Author Sales Contest. Currently Fight On! is in third place and Knockspell is in seventh place. Both publishers would like to finish in the top three, for which there is a monetary award, among other benefits. Perhaps more importantly, it'd be a signal that the old school renaissance represents a serious movement of more than just a few disgruntled old guys complaining on their blogs. Art of the Old School costs $9 and available for purchase from the webstores of either Mythmere Games or Fight On! Magazine. Buying a copy will help put one or both publishers over the top in the final contest standings. If you buy one from each store and give the extra to a friend, you can combine shipping even when your products come from different sources. You might also want to consider buying copies of Fight On!, Knockspell, Swords & Wizardry, and all the other great products these publishers have for sale. All products must be purchased by the end of March to count for the contest, and, as of April 1, Art of the Old School will be gone forever. It's going to be one of those weekends, I think. Ah well. More posts to come during the week and, once again, my apologies for the slowness of replies to comments and email. You'll find lots of gamers who will sing the praises of the Basic Rules published in the early 80s (either 1981's Moldvay version or 1983's Mentzer version) -- and rightly so -- but it's rare to find many who express the same affection for the Expert Rules, whether the Cook/Marsh or Mentzer version. I personally find that a bit odd, because, for me, the Expert Rules are one of those places I can clearly point to and say, "This is what D&D is all about." I'm certain that strikes at least a few people as odd. The Basic Rules introduce not only the rules of the game, but also its default setting: the dungeon. If anything is "what D&D is all about," it's the dungeon and surely the Basic Rules do a far better job of describing that environment and what it's like to play in it than do the Expert Rules, which muddy the waters with all this talk of wilderness adventuring and building strongholds and creating magic items and the like. Right? Well, I'm one of those oddballs who takes seriously the notion that Dungeons & Dragons, despite its name, is actually about more than dungeon delving. After all, OD&D devotes a goodly amount of its sparse verbiage to adventuring in the wilderness -- so much so that the term "sandbox" is every bit as significant for old school play as is "megadungeon." Indeed, OD&D makes it pretty clear that, after a certain point, the focus of the game shifts away from the dungeon and toward establishing and maintaining a "barony." If you read reminiscences of the earliest campaigns in the hobby, such as Blackmoor and Greyhawk, you'll see that this was the case. The Expert Rules present this shift in focus not as an "add-on" or accretion to the Basic Rules but as a natural development of them. Exploring and taming the wilderness, building a castle, and ruling a domain -- these aren't alien to D&D; they're a major part of what the game was intended to be about. This only makes sense, given the origins of the game in wargaming and yet they're topics that got short shrift even in AD&D, never mind later editions. In this sense, I'd say that, for all my issues with the presentation of Cook/Marsh and Mentzer, they're truer to OD&D than were their various descendants. I can't stress this point enough, because I think it's a vital counter-balance to the tendency to see D&D, especially old school D&D, as solely about acquiring ever more power in the service of venality. 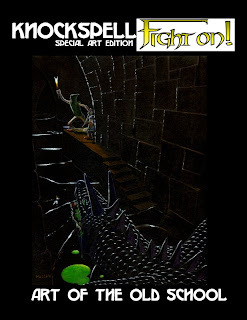 Not only do I think that tendency does a disservice to D&D's origins, but I also think it exaggerates the themes of pulp fantasy to ludicrous heights. While not every Picaro will eventually settle down, many will, particularly if their players wish to continue playing that character beyond a certain point. The Expert Rules showed how to do that; they were where D&D's endgame was fleshed out and revealed it as the logical extension of all that had gone before. 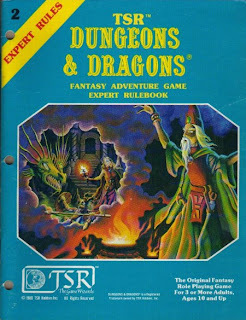 I hesitate to say that the Expert Rules are where Dungeons & Dragons "grows up," because that implies a childishness to dungeon delving that I don't think is appropriate. Nevertheless, the Expert Rules are where D&D grapples with the nature of what it means to have reached high level -- to have "grown up" mechanically -- in a fantasy world. Certainly characters could continue to remain aloof from the world around them, remaining outsiders forever on the make, but how satisfying would that be for their players? The Expert Rules offer up new options of play, things that characters could take up in order both to expand the scope of the game and to ensure that beloved characters can continue to be played even after it no longer makes much sense for them to continue adventuring. These are the rules for King Conan of Aquilonia, as opposed to Conan the wandering Cimmerian. I am ever more convinced that the progressive deformation of the original Gygaxo-Arnesonian vision of the game is due to the loss of D&D's logical endgame and its replacement by vapid alternatives. Only by restoring that endgame can Dungeons & Dragons again become the game it was meant to be. I'm a bit busy today, at least one of which I hope to unveil in the next day or two (I wonder what that could be? ), so my posting today may be light. I also have a large backlog of comments and emails to answer. My apologies for the delays in doing so. Such is the nature of actually having a life outside of blogging. Once again, Knockspell Magazine is running all old-school advertisements for free. If you have a blog, or a free module, or a website, or you're an artist (here we are a bit arbitrarily selective - you've got to be part of the old school community), or you're a retro-clone publisher, or publish materials compatible with 0e, 1e, Basic, etc ... whatever. Email Matt Finch at mythmere at yahoo dot com with the text of a classified ad, or with a quarter-page or smaller graphic (which must contain any text you want attached). Graphic ads will need to be approved - no photos, and artwork needs to be roughly in the general style of the magazine's internal appearance. Clip art is fine. Mythmere Games does this to show the full strength and resources of the old school renaissance, as a service to the readers, and as an expression of gratitude to those who are producing free (and paid) material for all the rest of us to game with. I readily admit that I'm not a wargamer. In general, I find wargames a bit too persnickety for my liking and, while I have a great deal of patience, I often find that playing most wargames taxes me greatly. That said, I still played wargames back in the day, mostly because my friend's Dad and older brother had lots of them and we often enjoyed a change of pace from our various roleplaying campaigns. Later, as my circle of gaming contacts expanded, I met a lot of other guys who really mixed wargaming and roleplaying much more easily than I ever did, leading to yet more dabbling in the field. 1776: I recall having a lot of fun playing the British. Civilization: Not really wargame, I suppose, but it was published in the US by AH, so I'm going to throw it in here anyway. It's a pity I never owned a copy, because I had a lot of fun with it. Diplomacy: One of the greatest games ever made in any genre, I played this game to death in high school. For some reason, I liked to play Austria-Hungary, which explains why I rarely ever won. Dune: How I wish I owned a copy of this game! Many good times were had playing this. Kingmaker: Like Diplomacy, I played the heck out of this game back in high school. It's a bit more formulaic than Diplomacy, but I loved it just the same. Magic Realm: It was a bit like a more complex version of Dungeon!, except that it mostly took place outdoors. I remember it took a long time to set up and play, but we had a lot of time on our hands in those days. NATO: The Next War in Europe: This was produced by Victory Games and I loved it to death. I think my friends and I enjoyed it mostly for the tactical nuclear weapons rules. Rise and Decline of the Third Reich: I have no idea why I played this game. I don't think I ever really enjoyed it, but several of my friends loved it and so I suffered in the name of friendship. Squad Leader: I never played ASL, but I did play the original. I liked it for what it was. I liked the hex maps even more and appropriated quite a few of them for use in my D&D wilderness adventures. Starship Troopers: This was fun, especially if you got to play the Bugs. Wooden Ships & Iron Men: I was never a big fan of naval games, but this one was enjoyable, even if it often felt very "game-y" at times rather than being a strict simulation. I know this topic has come up before, but it bears repeating: the hobby really needs an inexpensive yet complete introductory game. Yes, yes, I know we already have several, most notably Labyrinth Lord and Swords & Wizardry. The problem with both is that neither is available in non-specialty stores and neither looks like a game to the uninitiated. Here he goes again, blathering on about boxed sets. There's a reason I do that and it's simple: to people outside the hobby, you buy a game in a box, at least if it's a game you're going to pick up for kids to learn. I don't think it's a coincidence that the best-selling RPG products of all time have been boxed sets. I understand that producing a boxed RPG is expensive nowadays; that doesn't change the fact they're a very attractive way to package a game. The other vital thing is getting those boxed sets out to places like Toys R Us and Wal-Mart. Having young children, I go to toy stores quite regularly and there are a lot of fantasy themed games and products out there. Lego recently started a very cool line of fantasy sets that include knights, dwarves (complete with tankards of ale! ), trolls, skeletons, dragons, and wizards. How wonderful it'd be to see a RPG on the same shelves. I don't really know why D&D is no longer to be found in such places. You'd think, given the tentacles of Hasbro, that it'd be an easy matter to ensure the game was sold in them, but I haven't seen D&D outside of hobby and book stores since the 80s. I know full well that these aren't magic bullets. They won't turn back history and return roleplaying into the fad it once was. But I'd still like to see these games accorded the same opportunities that even collectible card games are (which you can get in Toys R Us). I recall Gary Gygax musing in the pages of Dragon that, one day, Dungeons & Dragons would achieve a steady state and become like Monopoly or Clue -- a classic game each new generation could discover and play with previous ones because the game was forever in print, easily available, and largely untouched by time. I like the sound of that. On this day in 1634, 150 settlers from England disembarked from two vessels, the Ark and the Dove, onto an island in the Potomac River. They named the island after Pope St. Clement I, patron saint of mariners, in thanksgiving for having safely crossed the Atlantic Ocean. March 25 is also the Feast of the Annunciation (called "Lady Day" in England), celebrating the visit by the archangel Gabriel to the Blessed Virgin Mary, a happy coincidence, as the colony these settlers were to found had already been named Terra Mariae, or Maryland, by King Charles I, in honor of his wife, Queen Henrietta Maria. 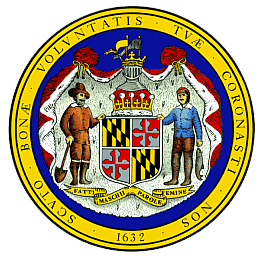 Though many of the earliest settlers were Protestants, the Calvert family, who sponsored the expedition, were Roman Catholics (as was the queen) and explicitly wished Maryland to be a place where all Trinitarian Christians could live together in peace, making it a model of religious toleration. Though I haven't lived in Maryland regularly since 1989, I still consider it my home. My formative years were spent in this lovely, quirky Midatlantic state and most of my blood relations still live there, including my parents. I remain a diehard Baltimore Orioles fan and miss steamed crabs and seafood that doesn't have to be transported hundreds of miles to reach my dinner plate. It was a great place to grow up and I suspect that my love for "rough edges" comes at least in part from having grown up in a state whose identity has been a weird mix of influences held in barely coherent tension since the beginning. Maryland's a southern state that never seceded and fielded regiments for both the Union and the Confederacy, though the state song's lyrics curse Abraham Lincoln ("The despot's heal is on thy shore," a reference to the fact that the District of Columbia was established on land donated to the federal government by Maryland). Geographically, it's both heavily urbanized in parts and extremely bucolic and wild in others. Our distinctive accent is like no other in the region and jousting is our state sport. And we boast a storied history of corrupt local politics of which perhaps only Louisiana can top. Too strong an attachment to the place of one's birth can be the source of much evil, as history has shown. At the same time, I can't help but feel that a little parochialism might be a useful tonic against the depredations of this age of globalization. I like local oddities and quirks. I prefer it when everything isn't the same bland pabulum no matter where you go. That's probably why returning to the old school feels so right for me. Like my experiences of home, we're a weird, confused, cantakerous bunch. It's easy for outsiders to look at us and dwell on the individual trees without seeing the glorious forest of which we're all a part. In the not too distant future, once I've got Urheim up and running (should be sooner rather than later) and I've gotten out from under some other projects I have cooking, I'm probably going to revamp the website a bit. Much as I like the look of the place as it is, it could be a bit better organized and easy to access, particularly when it comes to my old posts (especially reviews, retrospectives, and the pulp fantasy library). Likewise, I eventually need to find new images to use to decorate the place -- images I either actually own or that I am legally able to use. No one from WotC has complained about either my masthead or the Greg Bell pic on the right. Yet. But they'd be well within their rights to do so. I'd rather not give them the chance. I may also have to call upon the services of a professional web designer to help me with this. Seeing how nice the new Mythmere Games site is, I have to admit to being a little envious. No ETA on when any of this might happen, but it's slowly moving to the front burner. For those who haven't heard the news, Fight On! magazine is currently ranked #2 in Lulu.com's "Author Sales Contest." What that means is that, during the period beginning March 1 (and continuing through the end of the month), only one publisher has managed to sell more copies than has FO!. That's frankly a really remarkable achievement, considering that's an amateur fanzine selling primarily to a niche market. The top three spots receive monetary rewards and I know that Ignatius Umlaut would put the reward to good use. So, if you haven't yet bought a copy of Fight On!, now's the time to do so. If you have, thanks for your support. And while you're at it, grab a copy of Knockspell #1 too, another superb old school fanzine. One of the inevitable consequences of preferring what some have patronizingly called "legacy D&D" is being treated like an exhibit in a natural history museum: "And here we have a fine example of Primitive Gamer, mussitor crassus barbatus, who thrived between 1974 until 1983. Unable to adapt to the changing environment of gaming, his numbers dwindled precipitously. Though scattered tribes of Primtive Gamer still exist, their vitality is sapped, their gene pool shallow. It is only a matter of time before he becomes extinct, taking with him his strange ways, most notably spending his spare time not actually gaming, as one might expect, but complaining about more evolved forms of Gamer." For reasons I don't fathom, it's a common stereotype that grognards don't in fact game. I'm not sure where this myth came from, because my experience is that old schoolers are no different in their gaming habits than most other gamers. That is, we game as often as we're able to do so, given the demands of our real lives. Certainly we don't game as much as we used to when we were teenagers, but then who does? From what I have gathered, wanting to game and not having a group with which to do so is a pretty common problem, not restricted either to old schoolers or to D&D players in general. Yet, for some reason, there's this perception that grognards never actually get together with their friends and roll some dice together. All one would need to do is read old school blogs and forums to see this for the lie it is. The most active blogs in our community are filled with discussions of the author's ongoing campaigns, not to mention events at conventions. I'd never argue that old school play is common or that its numbers are as great as those playing the latest and greatest, but since when did quantity becoming the determinant of whether grognards actually game? Our numbers are but a drop in the wider ocean of gaming. Consequently, measuring how many fewer 1e events there are at GenCon compared to 4e and then using it to opine that grognards don't play strikes me as the height of idiocy. I suppose, to some extent, this misperception is based on the fact that grognards spend a lot of time talking (or writing) about gaming. As a rule, I'd wager that our blogs and forums are, for wont of a better word, much more verbose than those of other games. We spend a lot of time dissecting the rules, divining wisdom from lacunae, and constructing esoteric philosophies of play and design from our sacred texts. Of course, I'd argue that so do most gamers. It's just that old schoolers do it in a particular style that might lead outsiders to misunderstand what we're doing or why. My own blog, for example, has what at least one detractor has termed "a pseudo-intellectual" style and, while there's no doubt that my chosen idiom is a lot more extreme than that of many of my fellow bloggers, we are all cut from a cloth you can't buy in the big box stores. We're an idiosyncratic, eccentric bunch and our discussions probably aren't easy to pentrate if you're not already steeped in the old school midrash. Because of this, perhaps it seems as if we're more focused on gaming in the abstract than we are in actually gaming. It's a polemically useful stereotype, to be sure, but that's mostly all it is. Believe it or not, grognards do game and some of us game quite a lot. To that end, if you're currently running an old school game and talk about it on your blog, state this in the comments section of this entry, particularly if you do so on a blog or forum I don't have linked to the right. 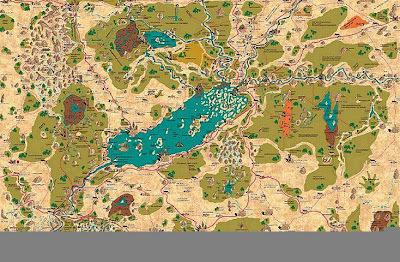 Jeff Rients recently reminded me of the awesome map of Minaria from Divine Right (a game I never owned but wish I had). Another terrific map is the map of Arduin. Here’s some “from the horse’s mouth” information you can pass on to your readers concerning my future publications. The fourth Imaro novel will soon be published by Sword & Soul Media, and, like the third one, will be available via print-on-demand. The fifth Imaro novel is in the pipeline, as is a collection of Imaro short stories that were not blended into the novels. The collection will also include three brand-new Imaro stories I wrote in 2007-08. At present, I am working on a new Dossouye novel. After I finish it, I have some other ideas I want to pursue. And there you have it. As I said in my original post, now's a good time to give these novels a try. If you enjoy them, as I do, there's lots more in store for you over the next few years. Charles Saunders's Imaro doesn't appear in Appendix N of the AD&D Dungeon Masters Guide, but I like to think that's only because the novel didn't appear until 1981, two years after the DMG was first published (though, to be fair, its titular character first appeared in Dark Fantasy in 1974 and a year later in the very first Year's Best Fantasy Stories). That's a pity, because Imaro and its sequels are remarkable books, at once thoroughly steeped in the traditions of pulp fantasy and original creations that transcend and transform the genre in ways that recall Michael Moorcock's tales of Elric. By this, I don't mean to imply any dramatic, let alone thematic, connection between the writings of these two authors. Rather, it's that both Saunders and Moorcock turn critical eyes on the tropes of pulp fantasy in ways that only writers who understand and love the genre, warts and all, could do. Saunders isn't an ignorant young Turk out to prove himself by denigrating his pulp fantasy elders, but instead a writer who clearly appreciates them, even as his own unique vision is at least in part a corrective to what he sees as their weaknesses. Though originally billed as "The Epic Novel of a Black Tarzan," which led to the delay in its publication because of a lawsuit by the estate of Edgar Rice Burroughs, I think it's the writings of Robert E. Howard that cast the longest shadows over Imaro. Saunders's Nyumbani is a close cousin of REH's Hyborian Age, being a fantastical Africa that draws equally from history and myth to create an imaginary world that artfully mimics the depth and texture of reality. 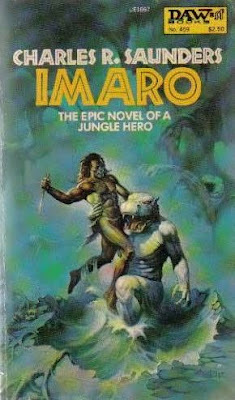 Reading through Imaro, one is immediately struck by the opportunities pulp fantasy has lost over the years by not turning its gaze more readily upon non-European settings for its inspirations. It would be a gross over-simplification to call Imaro a "black Conan" as some have done, not least because Imaro's motivations and ultimate destiny are far more inward-directed than are those of the Cimmerian. Nevertheless, it's hard not to compare him to Howard's creation, as Imaro is one of the few swords-and-sorcery characters to match -- and perhaps exceed -- the complexity of his barbarian predecessor. Indeed, Saunders excels at writing characters who feel like people rather than caricatures and it's here, I think, where Imaro shines brightest and offers the most strident critique of the genre of which it's a part. Saunders isn't content to paint with broad strokes, particularly when it comes to entire peoples and societies. Nyumbani is not only beautifully drawn, but diverse and variegated. Its inhabitants are similarly diverse and well realized, in stark contrast to the more stylized approach favored by many other pulp fantasy tales. Reading Imaro, one is often subtly reminded of just how often even writers as talented as Howard relied upon stereotypes to do the heavy lifting in their characterization. And because the reminders are subtle, one never feels as if Imaro was written solely to criticize or make a point. The novel isn't a parody or a satire of the genre but rather an unapologetic illustration of its under-used potential, not to mention a celebration of its primal appeal. If it sounds like I'm gushing over Imaro, it's because I am. I never read this novel or its sequels back in the day and I doubt I would have appreciated them even if I had. Having filled in this gap in my pulp fantasy education, I can't help but imagine many "what if?" scenarios in which Saunders's stories had become more widely read and influential. Had this occurred, it's possible that swords-and-sorcery might have renewed itself, remaining vital and energetic until the present day. Fortunately, the novel and its sequels have been reprinted and are available once again. Likewise, Saunders has written another novel set in Nyumbani, about the warrior-woman Dossouye, and is working on two more novels in the saga of Imaro. If you've never had the opportunity to do so before, there's no better time to delve into the adventures of Imaro than right now. The film's soundtrack, by the late Basil Poledouris, is pretty much perfect in every way. The film's 1984 sequel, Conan the Destroyer, was abominable. Unfortunately, that's the extent of the common ground between the lovers and the haters of this film. I was 13 when this film was released, but, due to its R rating, I didn't see the film until it was released on video sometime afterwards. At that point, my exposure to the character of Conan was limited primarily to a handful of Lancer paperbacks I'd picked up here and there, almost none of which contained any actual stories by REH. Consequently, I wasn't much bothered by most of the divergences from the Howardian canon, because, quite frankly, I was utterly unaware of them. Having only read (I think) parts of Conan the Avenger and Conan of Aquilonia, my sense of the both the character of the Cimmerian and of the Hyborian Age was lacking. I'd also seen the covers of many a Marvel comic featuring Conan, though I'd never read one. Given this background, the story and character we got in the film matched my own expectations reasonably well. Indeed, if one takes Conan the Barbarian simply on its own terms, as a swords-and-sorcery tale vaguely inspired by some names found in Robert E. Howard stories, I think it still holds up quite well. Certainly it reaks of pastiche. Untutored though I was in the mysteries of pure Howard back then, I could still sense that it was a strange, cobbled together Frankenstein of a movie, unapologetically borrowing elements from a wide variety of sources. I don't consider "pastiche" a term of opprobrium. 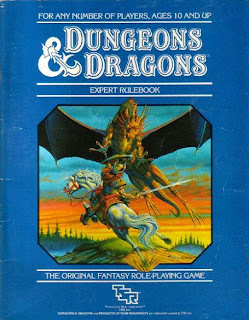 Dungeons & Dragons wouldn't exist if not for the gleeful pastiche-making of Gygax and Arneson and, as readers of this blog know, I actually believe D&D is at its best when referees and players alike adopt a similar approach in their own games. Yet, there's little question in my mind that Conan the Barbarian can't really be called "Howardian" except in a tenuous analogical sense. Yes, there are characters, themes, and even scenes that appear in the film that are broadly consonant with Howard's own work. However, I can't recall a single line of dialog in the film that comes from a REH story (someone can correct me if I'm wrong) and there are a few places where I feel the film actually undermines Howardian themes, replacing them with its own. Again, I don't mean this in a negative sense. Much like D&D, I think there's virtue to be found in creating one's own story by looting the parts of other stories one likes. So long as one doesn't mistake this for "being true to the spirit" of authors and stories one loots, you won't hear a peep of criticism from me. As I got older, though, I read more genuine Howard and came to appreciate his work considerably more than I ever had as a youth. It's hard now, with the knowledge of and love for those stories that I now possess, to view Conan the Barbarian as much more than a typical example of Hollywood grave robbing, albeit a riotously fun example of it. As I said before, if this movie had been about some other northern barbarian seeking revenge against the slayer of his parents and people, I could continue to extol its virtues without qualification, because I think Conan the Barbarian may well be the best swords-and-sorcery movie ever made. Admittedly, that's as much an indictment of Hollywood's woeful treatment of the genre as it is praise for the film, but I mean it positively. 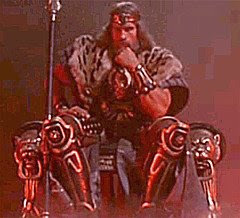 Conan the Barbarian is a fun, occasionally insightful, feast for the eyes and I enjoy it on that level. I think, though, that it's also an exercise in brandification, playing off the fame of the name "Conan" to tell a very different story than any Robert E. Howard would have told. For many people, Schwarzenegger's portrayal of Conan in this film is the only exposure to the character they will ever have and that's a shame -- not because I think Schwarzenegger's portrayal is bad (I don't) but because his portrayal has very little to do with Howard's Cimmerian. Now, for many, this isn't an issue, in much the same way that they can shrug off the brandification of D&D over the years. If one has no particular knowledge of or liking for the real Conan, this criticism likely rings hollow. And of course many people who possess both still don't see it as a fatal flaw to what I cannot deny is a well-made fantasy action film. So where does that leave me? I still don't know. Part of me just wants to sit back and revel in the spectacle of it all, for the film has many terrific moments that I absolutely adore. Another part of me recoils, though, at the hash made of Conan, the Hyborian Age, and the auctorial voice of Robert E. Howard. Even more than the Peter Jackson The Lord of the Rings films, Conan the Barbarian misrepresents its ostensible inspiration to audiences who might otherwise not be familiar with them. Traditionalist that I am, I can't help but be bugged by that. Is that enough to make me stop watching the film every now and again? No, it's not, which makes me wonder if why. Do I continue to enjoy it in spite of the things I dislike about it or do I perhaps sense some hidden depth to the film that I'm not yet consciously aware of? Or is it that I just hope that there's something of substance beneath the spectacle? I wish I knew. Here's the section on psionic combat I promised. I'm a bit ambivalent about it, as it stands now, so I'd appreciate criticism that would improve it. I want it to remain fairly simple to use and I want to keep psionics as a side show by default, meaning that it never overshadows either melee or magic. Ideally, though, it should be easily changed to work as a substitute for magic in certain kinds of settings, so keep that in mind too. I'm also toying with changing the number of power points available by level, since, as written now, psionic combat would be difficult for low-level characters to engage in for very long. That's by design, but I do worry it might be too hard as written. Once again, comments and suggestions are welcomed and encouraged. In addition to employing psionic powers (see below), psionic creatures can also engage in psionic combat with one another through the use of psionic attack and defense modes. Psionic combat functions similarly to melee and missile combat, with an attack roll made against a target's psionic armor class (PAC). If successful, attacks deal damage that reduce the target's current psionic power points, just as melee and missile attacks reduce the target's hit points. If psionic power points are reduced to zero, the psionic creature may no longer use psionic attack/defense modes or psionic powers. Such defenseless psionic creatures are even more susceptible to psionic attacks than are non-psionic creatures, as noted below. All creatures, psionic and non-psionic alike, have a base psionic armor classs of 9. The creature's Wisdom bonus (if any) affects the PAC. Psionic attacks are treated as if made by a first-level character, meaning that a roll of 10 or more on 1D20 is necessary to succeed against PAC 9, adjusted by the character's Intelligence modifier (if any). A character's Charisma modifier may apply either to PAC or the attack roll, at the discretion of the player. The modifier may be shifted between the two on a combat-by-combat basis, but not within a single combat. Like melee and missile combat, creatures engaged in psionic combat must select “weapons” and “armor” for the occasion. Each round, players must choose an attack mode and/or a defense mode from among those available to their characters, provided they can pay the power point cost for using them. Power points are expended before the attack or defense is used, regardless of whether they prove successful. However, once activated, they may be maintained without any cost for the duration of the psionic combat. Activating a different attack or defense mode, however, requires the expenditure of power points, as does re-activating modes formerly maintained. Some attacks are more effective against certain defenses than are others. The following chart shows the bonus or penalty to the psionic combat attack roll. All psionic attack modes suffer a -8 attack penalty against non-psionic creatures, except for mind blast, which gains a +4 bonus. Conversely, all attack modes gain a +8 attack bonus against psionic creatures who no longer possess any power points. Unless otherwise stated, all attack and defense modes affect only a single creature at a time. Likewise, a psionic creature can always raise a defense mode as a reaction in response to a psionic attack mode, even if he or she has already acted in the round, unless the creature no longer possesses any power points. Such a reaction requires the expenditure of power points, as usual, however. An ego whip targets the “I” or self and, overwhelming it with negative or vicious feelings that inhibit its ability to function properly. As such, this attack mode is only usable against a sentient being. A successful use of an ego whip deals 1d6 points of power point damage to a psionic target, while non-psionic creatures are stunned for 1d4 rounds. This defense mode induces a low-level meditative trance in which the mind of the creature using it becomes less distinct from the world around it. Id insinuation attacks a target's basest instincts, freeing them temporarily from the control of his or her higher psyche in order to induce confusion. A successful use of this attack mode deals 1d8 points of power point damage to a psionic creature, while non-psionic creatures are stunned for 1d6 rounds. This defense mode summons the strength of the higher psyche to create a powerful bulwark against psychic attack. This defense mode draws on innocuous, repetitive thoughts to shield the mind against unwanted intrusions. This attack mode blasts the minds of all creatures in a 40-foot cone with mental energy, dealing 1D12 points of power point damage to a psionic creature. A non-psionic creature is more susceptible to mind blast than to other psionic attack modes. On a failed saving throw, a non-psionic creature is stunned for 3d4 rounds. This attack mode shapes mental energy into a “psychic blade” with which to “stab” the mind of the target. This deals 1d4 points of power point damage to a psionic creature, while non-psionic creatures are stunned for 1 round. This attack mode uses neural impulses to assault the target's mind, thereby rendering mental activity more difficult. A successful attack deals 1D10 points of power point damage to a psionic creature, while a non-psionic creature is stunned for 2d4 rounds. This defense uses ephemeral, surface thoughts to protect the mind from attack. This defense mode harnesses a creature's determination and mental resilience to fashion a psychic barrier so powerful that it can protect other creatures, psionic or not, within a 10-foot radius around the user, who gain the full benefits of this defense mode as if they were using it themselves. 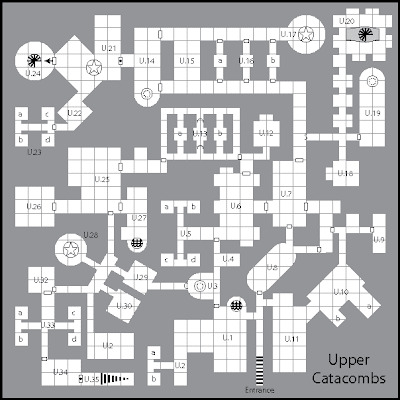 This is the map of the Upper Catacombs beneath the surface ruins of the monastery. It's not part of the "true" dungeon levels, but I really like it. Combined with the ruins themselves, the Lower Catacombs, and the Hermit Caves, there's plenty to do at Urheim before descending into the maw of Chaos itself. I'm really pleased by this set-up, since lots of lateral movement and meaningful choices about how best to proceed are an important part of designing a good megadungeon. Thanks, as ever, to the talented Fr. David for his cartographic work. Short version: Much better than I'd expected but also much pricier than I could justify spending (which is good, since Monte Cook very kindly gave me a free month's access). As people should know by now, I am very -- how shall I say? -- protective about the term "old school." I'm one of those rare birds who strongly believes the term is both meaningful and useful, which often puts me at odds with some of my fellow gamers, who, for different reasons, would prefer that it be banished to the terminological netherworld. Ironically, this fact hasn't stopped lots of people from throwing around "old school" to describe games and products that, by any reasonable definition, are nothing of the kind. But I readily admit that I'm an eccentric among eccentrics on this score. 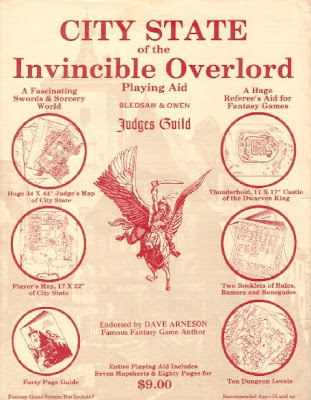 So, when Monte Cook conjoined the words "megadungeon" and "old school" when announcing his latest project, Dungeonaday.com, I was among only a handful of grognards who took it as an affront (a "hissy fit," one ENWorlder called it). There are several reasons I felt this way, the main one being that the old school renaissance is really hitting its stride right now. Lots of gamers are taking notice of our little corner of the Net and engaging our ideas in a way they never did before. "Old school" and "megadungeon" are now regular topics for debate and conversation on forums and blogs and I don't think there's any question it's because traditional gamers have done a great job of showing their continued relevance to the hobby. The second reason I felt as I did was because it wasn't someone I strongly associated with old school D&D who was launching this site but Monte Cook, whom I primarily connected to the decidedly not-old school Third Edition and Return to the Temple of Elemental Evil, a module I both disliked as an adventure and that I felt misrepresented Greyhawk lore. To be fair, Monte did a lot of stuff I did like, such as his various Planescape products, but I don't consider Planescape "old school" by my definition. Finally, I was miffed by the subscription model, which I think is problematic when you're dealing with an electronic product. I realize that most professional game designers aren't going to follow the approach of the old school renaissance and give things away for free, but there's something about paying for the privilege of having a product parceled out to you in small pieces over many months rubs me the wrong way. Combined, my first reaction to Dungeonaday.com was probably irrationally over the top, even if it was understandable. Having now had a chance to explore the site at much greater length over the last week and a half, I'm in a much better position to evaluate it on its actual merits and flaws rather than on what I presumed it would be like. What I found was something that was decidedly more old school than we've probably seen from a big name designer of the 3e era. By that I mean that, if Monte Cook is a poser, he's doing a very good job of it. Dragon's Delve, the megadungeon he's constructing, hits most of the right old school notes. There is in fact a great deal to like about it and I'm not ashamed to admit I may even steal an idea or three from it. At the same time, Dungeonaday.com also highlights how much WotC D&D has strayed from its heritage, both mechanically and philosophically. Dungeonaday.com is a very straightforward and easy-to-use website. Navigation is simple and intuitive. Each page is nicely presented, with just enough graphics to be useful but not so many as to create visual clutter. I know some people have expressed disappointment at its relatively "bare bones" look, but I personally find it refreshingly elegant. The pages load quickly and I never had any trouble figuring out where to find what I was looking for. There's also a built-in search engine in case you still have difficulty, along with forums to which Monte regularly responds with answers, even to technical questions about the site. All dungeons live or die by their maps and Dragon's Delve has some nice ones. First there's a side view map of the place, which I just love. Not only does it remind me of the best old school dungeons, such as Stone Mountain from the Holmes set, it's got a lot of flavor in its own right. I love each level of a dungeon having a name that describes it and apparently Monte Cook does as well. Level 1 is so far the only level to have its own map, which is to be expected, since the site is detailing Dragon's Delve a couple of rooms a day. Level 1 is fairly small by the standards of truly old school megadungeons, but Monte has indicated that deeper levels will be bigger. Personally, I think size is a fairly small quibble, although I do agree that it would have been nice if Level 1 had more obvious room for expansion, since near-infinite expandability is an important quality of the megadungeons of old. On the other hand, the map doesn't strike me as too obviously linear, with lots of options for meaningful decisions. Each room receives its own page on the site, complete with an image of a bit of Dwarven Forge dungeon terrain constructed to represent it. I think that's a great idea, actually, first because it provides the referee with a better idea of what the room looks like, and second because it keeps the level map uncluttered with too much detail, a flaw common in many modern dungeon maps. As you can see by looking at a sample room, the descriptions are exhaustive, far moreso than I generally like. This is true even of otherwise empty rooms, since Monte has stated that, "Each [room] will have something of interest, and most will be fairly elaborate." This is a case where I think the realities of his subscription model -- providing something "meaty" every day -- has trumped old school dungeon design principles, which demanded not only a large number of otherwise empty rooms but empty rooms without much of interest in them. Looking back at the sample room, you can see a few features that I think are telling. As noted, they're highly detailed, meaning you can just read the description and run with it; there's little need to wing it. Whether one considers this a good or a bad thing is a question of taste, I suppose. The information is presented very clearly and is well organized, however. You'll also immediately notice how unwieldy 3e D&D is, since game mechanics, particularly the stat blocks of unique NPCs take up a lot of space. You'll also see that pretty much everything in the dungeon is quantified, with Difficulty Classes aplenty, not to mention formulae for calculating the effects of spells, etc. I recall Monte Cook stating that he was amazed at how "light" the mechanical component of Dungeonaday.com felt to him, but, from my perspective, I found it the opposite, but then I play Swords & Wizardry these days. Many rooms also include a "Revisit" entry, which explains what the room will be like once the PCs have cleared it of its original inhabitants. That's a nice touch and one that goes a long way toward conveying that a proper megadungeon isn't a static place. There are also wandering monsters, for which I give Monte bonus points. Overall, the site is extremely slick without being soulless. It's easy to use and has lots of nice features, like the ability to download every page (or print it off) as a PDF, as well as hyperlinks to the D20 SRD and other useful outside sites. I hope there will be an ongoing compilation of the entire dungeon, as the Greyhawk Grognard is doing with his The Castle of the Mad Archmage. That would go some way toward making up for the lack of a print product associated with the subscription, since those who let their subscriptions lapse would still have something to show for the money they spent beyond some disjointed PDFs. In addition to the aforementioned forums, Monte also has a blog where he discusses the design of Dragon's Delve and related topics. A lot of it would be of interest to old schoolers, I think, but much of it is also well known to us and there are also times when it's clear Monte has very different interests and priorities than we do, at least some of which stem from the design philosophy behind 3e. Dungeonaday.com is a very ambitious project and a good enough idea that I'm going to be imitating it in broad terms. I would still balk at calling it "old school" without qualification, since both its native rules set and the nature of the subscription model demanded compromises I don't consider wholly congenial. Despite that, there are many nifty things in Dragon's Delve, as I said, and, in most cases, you can "retro-fit" its contents to make it more amenable to the TSR editions of the game. And there are times, such as in the presentation of puzzles, where Monte seems to understand the limits 3e places on play and so abandons mechanics entirely to make it a challenge to the player rather than his character. This isn't revolutionary to old schoolers, but I imagine it might be to a lot of younger gamers, for whom 3e is the first D&D they ever knew. In this way, Dungeonaday.com might prove an unexpected ally to the old school renaissance, by disseminating its ideas outside of the narrow confines of our community, but it's too early to tell. In the end, my biggest beefs with Dungeonaday.com are the price and the subscription model. At $10 a month ($8 a month if you subscribe for 12 months, reduced to $7 a month if you do so before the end of March), it's too rich for my blood, considering that I already have my own Dwimmermount, not to mention Urheim, and a host of other megadungeons available for next to nothing. That's a shame, because I do think Dungeonaday.com shows great promise and hope its possible success will prove beneficial to the Old Ways. However, I'm not sure I can justify the cost in my particular case. Buy This If: You're a fan of Monte Cook, are looking for a new megadungeon, don't mind a subcription model for content and/or don't find the 3e rules a distraction. Don't Buy This If: You can't stand 3e rules, already have a megadungeon of your own, and/or dislike content being parceled out in small chunks over time.